EcoReflect is a novel work deck for inspecting surface quality. It permits exact, highly focused visual inspection with an innovative lighting design and an ideal ergonomic environment. 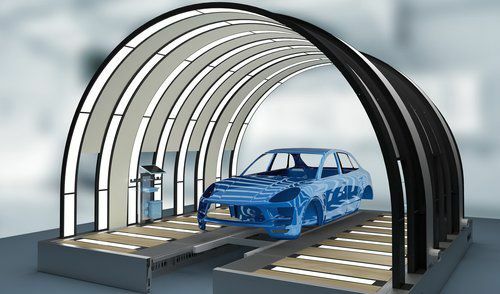 This allows paint irregularities to be identified consistently and with the best possible accuracy. Unlike conventional systems, EcoReflect uses vertical contrast lines to produce a reflected image that is bright but not too stimulating. It is not necessary to raise and lower your head to follow the body contours. Adapted luminance conditions between the interior and the surroundings permit concentrated, fatigue-free work. Using LED technology ensures high contrasts in the reflected images and produces areas with homogeneous illumination. EcoReflect is highly energy efficient, because its special curvature projects a particularly large amount of light onto the body. It consumes half the power of conventional fluorescent tubes.